Lighting is a key to all homes and can be never be underestimated, an area that Meme is passionate doubt, and sources extraordinary lighting. We create simple lighting designs that can transform spaces and creates stunning effects. A lighting lay-out is created, to enhance the interior environment, to meet practical needs, and to introduce decorative and task lighting, creating an atmosphere and tone to the interior. A space can be transformed using simple clever lighting design, please don't hesitate to contact with any queries you may have. Hind Rabii and Vintage Chandliers can be seen in more detail in the shop. Lancaster Gate interior design project: a vintage chandelier, also available in the shop. 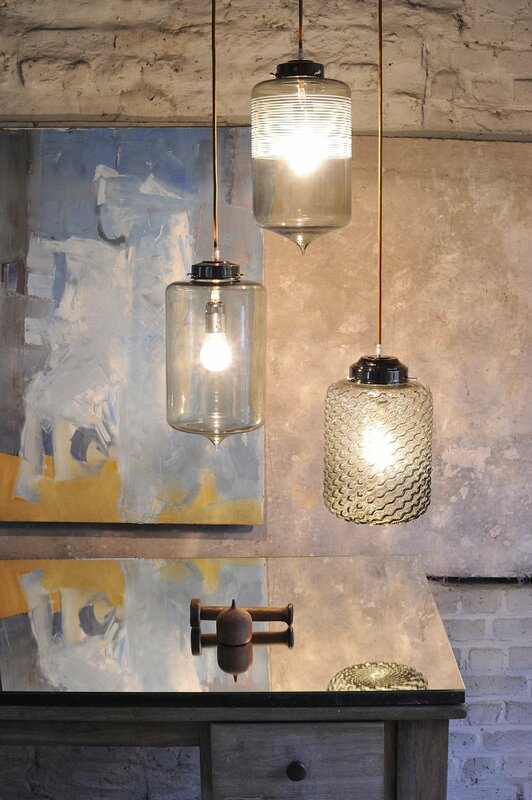 Marie's Corner showroom Blackheath / Kidbrooke: Funky hand blown glass pendents available in a vast selection of colours. Aberdeen Terrace sitting room, bespoke drum shades with bronze lining and diffuser, set with Teal Blue Table lamps and silk taupe shades. Vintage chandelier available in the shop. T-Cotta Hind Rabii lighting available in the shop. Wooden wall lights, please enquire within. Table lamps in grey ceramic with white shade, please enquire within. Hind Rabii M1 T Gold - see more details in the shop. Georgette Place interior design project, Stunning Barbara Barry lamp, please enquire within. Granville Park interior design project: Floor lamps in Nickel with blown glass and tassels, oyster ceramic table lamps and purple lampshades adding strong accents of colour to the scheme. Granville Park interior design project: Dual purpose Snug and spare bedroom with a pendent Drum shade with hand crafted fluted glass detailing. Granville Park interior design project : An elegant Hallway using nickel figurative lights with oyster shades, complimented by a bespoke drum pendent. Pretty pendent lights creating and a bespoke cylinder lampshade with diffuser to create a very soft and pretty light, controlled with dimmer switches. A key element to any bathroom design, Art Deco style wall lights frames the wall unit, which has a built in LED light around the mirror. Back lit shelves creating a glamorous feel.